Online slots based on horse racing are a little few and far between but there are one or two about; Net Entertainment’s Champion of the Track is probably the best one we’ve played this is Microgaming’s version and it’s called Sure Win. It comes complete with an authentic trackside soundtrack and a bonus feature. 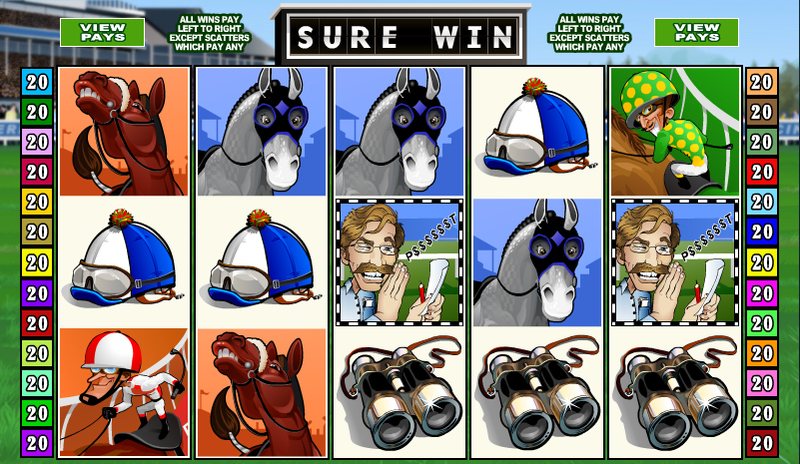 Sure Win plays out over five reels and twenty five paylines and the reels are set against the backdrop of a real photo of a horse racing venue. Moving on to the reels and they contain an entertaining mixture of cartoon quality symbols. From low to high value we have a pair of binoculars, a jockey’s helmet, cash in a money clip, a winner’s trophy, three cheerful horse and then their three respective jockeys. 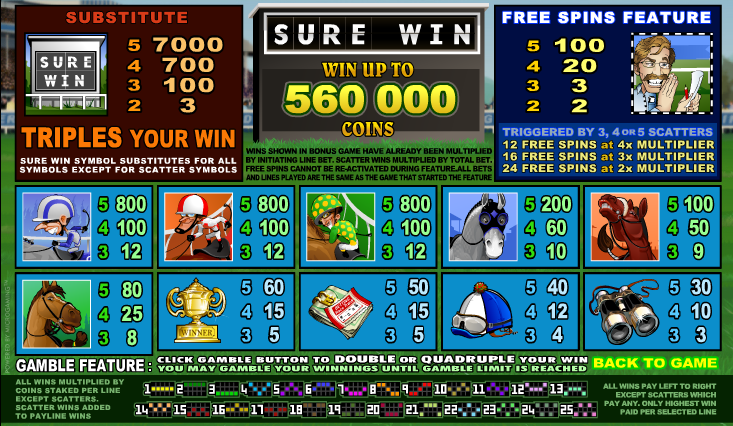 The Sure Win scoreboard is wild and will triple your win in the base game if it contributes to a winning payline; the scatter symbol is a whispering tipster and he’s worth up to 24 free spins in the main feature. The choice is of course yours but we tend to go straight down the middle and opt for the sixteen free goes with the 3x multiplier. All wins can be gambled by clicking the ‘Gamble’ button underneath the reels; it’s s card prediction game in which you can double or quadruple your money by picking the correct colour or suit. Five correct gambles is the limit and then you’ll be taken back to the base game with your winnings. We always advise care when using the gamble feature – it’s the quick way to deplete your bankroll. Gamble occasionally, not on every win and don’t try and go for more than one or two correct guesses in a row. This is a pleasant enough time waster which sounds and looks good but for a racing-themed slot, Champion of the Track is probably the more entertaining.